Growing up in Brooklyn, New York and working in the heart of New York City at the age of 14, left me with a comfort zone being around people, the streets of NY and the intense pace of life in the city. I began my career working for my Mom at Nathan’s Famous on 43rd and Broadway in New York City. Traveling into the city after school and on weekends by bus and subway and walking up and down 42nd street to get to the bus terminal (prior to 42nd St. being sanitized) was eye-opening for a 14-year-old. I’ve always loved observing and there was no better place to watch and document the world go by than New York City. I remember “borrowing” with my Dad’s Argus camera and returning it to its place before he’d get home. I’ve had a fascination with the West for years and have been seeking and creating opportunities to create personal work in that environment. The West inspires me. I’ve lived in cities my entire life, so it’s a huge visual treat to be in such beautiful open territory. I suppose it’s a combination of the color palette, the light and the vast openness. 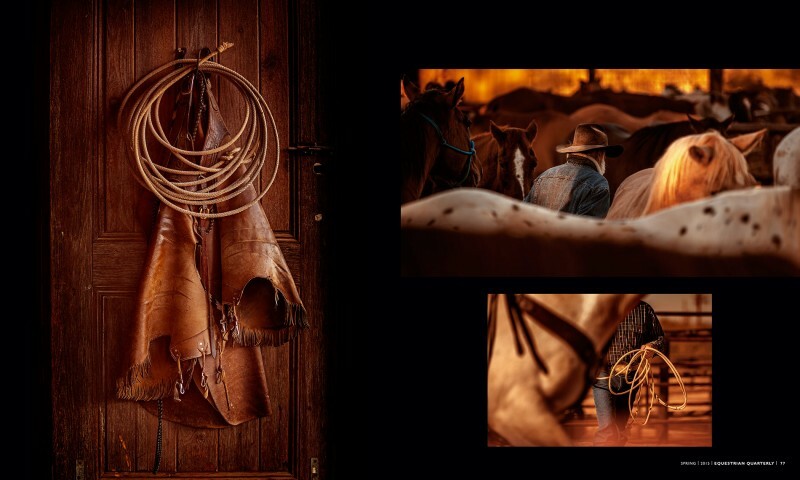 I admire the life of cowboys and the connection they have with their horses. It’s kind of like the connection I have with my Harley on a road trip. Shooting this type of personal project allows me to capture an inspired authenticity in the moment, I don’t project myself into the scene or direct. It’s inspiring to forget about everything else and become the lens for a few moments. 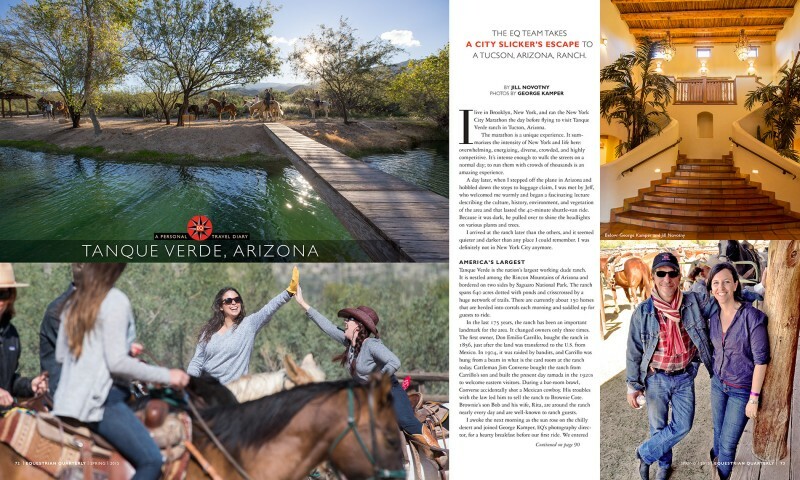 The Tanque Verde Ranch Personal Project came together when I found out that EQ Magazine, where I am the photography director, had been invited to come out to Arizona to attend a press junket for a couple of days along with several other editors. I reached out to our Editor and requested to go along for the ride and they accepted. 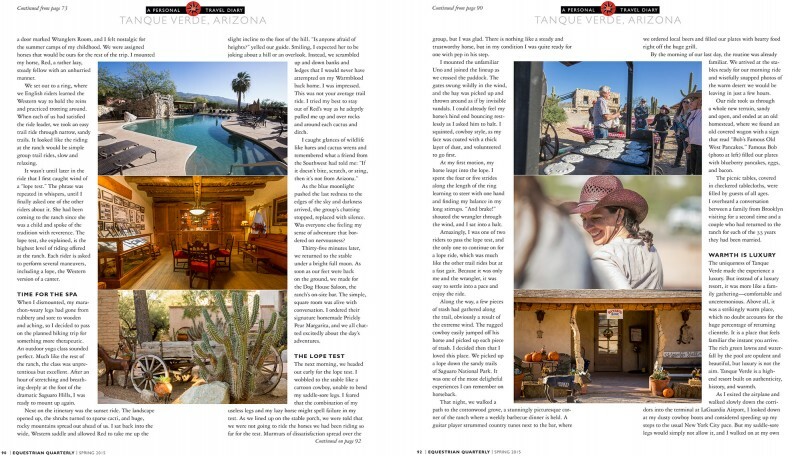 I was fortunate to have most of my expenses covered by the gracious folks at Tanque Verde, and I picked up my incidental travel and meal expenses. Since I now had a dual role of producing images for the magazine as well as for myself, I decided to shoot my personal work early in the mornings before the group gathered for their first scheduled event. 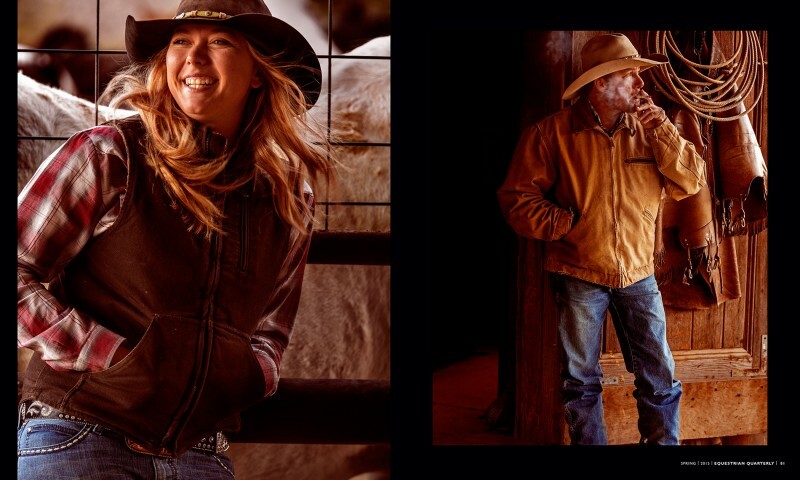 I approach my personal work and client work a little differently in that I take the “fly on the wall” approach to personal work and impose myself very little, versus directing and controlling my commercial work to guarantee the client comes away with what they need. Both approaches have treated me well, and I’m hoping more clients can appreciate the “Let’s get out there and see what transpires” approach. I post most of personal projects on Facebook, Instagram, Behance, Workbook, Tumblr, Altpick.com etc.. Every once in a while I’ll post a commercial gig. I also submit my work to various blogs. I’ve been fortunate that clients appreciate my personal work and refer to it when discussing an assignment. 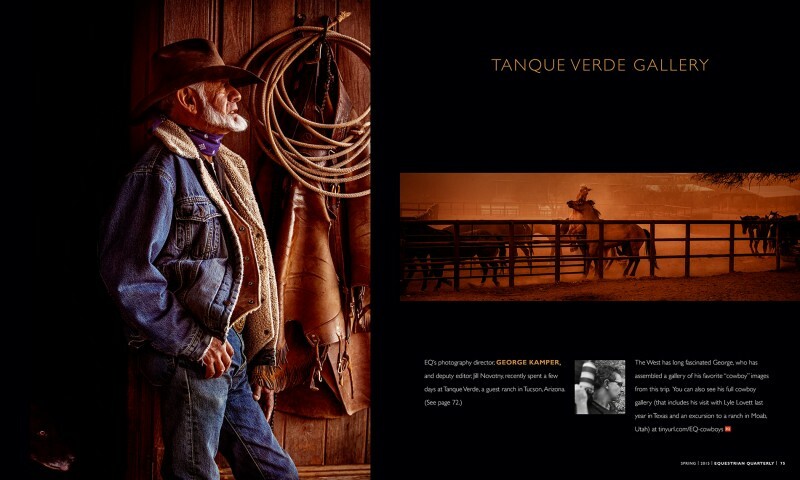 The Tanque Verde shoot took on it’s own life at EQ, as the editor and publisher decided to run a featured multi page gallery of my personal images in the magazine and the EQ Website. They also had a separate story that included images I shot for the editorial. See more of George Kamper’s work on his website and Altpick.com page. 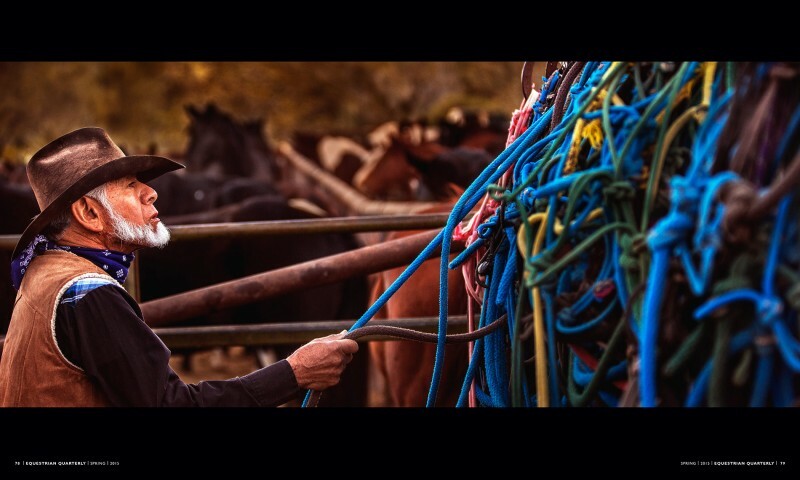 This entry was posted in Photography and tagged EQ Magazine, george kamper, Tanque Verde Ranch. Bookmark the permalink.